There are more great news to Transformers fans, especially die-cast collectors and Alternity/Binaltech fans! The Takara Tomy Alternity A-03 will be Suzuki Swift, featuring Bumblebee with Champion Yellow version and Pearl Red (Cliffjumper maybe). At this time, we only received the raw picture with yellow Bumblebee and Suzuki Swift sketches. Will definitely update more pictures when available. 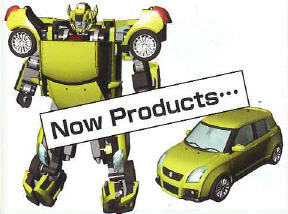 The 1/32 scale Alternity A-03 (Yellow or Red version) is RM159 each and release date will be Nov 2009. Preorder now at Toywiz Malaysia and secure your order today! Item in stock now and selling hot at RM159. Sorry Im new to this site…may i know whats the procedure to preorder?